In late 2003, Idaho was awarded a $375 grant from the Council for Opportunity in Education (COE). These funds were to be used by Idaho’s TRIO professionals to develop a state association and an informational brochure/booklet highlighting the state’s TRIO programs. The bylaws for the Idaho Association of TRIO Professionals, or IATP, were ratified on December 8, 2003. 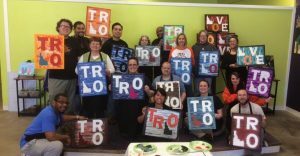 In its formative years, the association created an informational brochure/booklet to inform stakeholders of TRIO’s effectiveness, developed a website and listserv, and engaged in annual advocacy efforts at the state (Leadership Meetings) and national (COE’s Policy Seminar) levels. IATP’s efforts also focused on attempting to compile a statewide directory of TRIO professionals, as well as collect statewide data from Idaho’s TRIO programs. The association faced significant challenges due to the vast distance between the few TRIO projects that existed in Idaho at the time. Funding for IATP’s activities came from its regional TRIO association, the Northwest Association of Special Programs (NASP, currently NAEOP), and COE State Initiative Grants. IATP’s first state conference, or Idaho TRIO Summit, was held on April 23-24, 2008, at Lewis-Clark State College (Lewiston, ID). With forty-five attendees, this meeting was the largest collaboration between Idaho TRIO professionals to that point. Prior to this time there had been two regional conferences per year – fall and spring. The change to a fall regional conference and spring state conference schedule played a significant role in IATP’s development to what it is today. In 2010, IATP obtained 501(c)(3) status, giving the association the benefits that come with being a tax-exempt nonprofit organization. The following year, the IATP Facebook page called “Idaho TRIO Alumni Connections” was created by an Emerging Leaders Institute participant to increase communication between programs, TRIO professionals, alumni, and the community. In 2011, the current rotation schedule for the state conference and student leadership conference was established so no single institution would be responsible for multiple events in the same year. Additionally, the IATP TRIO Achievers Dinner, funded first through a 2011 COE State Initiative Grant, was added to the state conference to honor the fine accomplishments of Idaho TRIO alumni. Currently, IATP has three committees to further the work of Idaho TRIO professionals: public relations, alumni relations, and government relations. IATP is the byproduct of hard working professionals who strive to strengthen the TRIO programs that exist and communicate their effectiveness with others in our state. TRIO Works!